An excited buzz could be heard within the Gaertner Performing Arts Center. People dressed in a multitude of colors filed in one by one and the murmur of a pleasant chatter could be heard in the background of the well-decorated lobby. 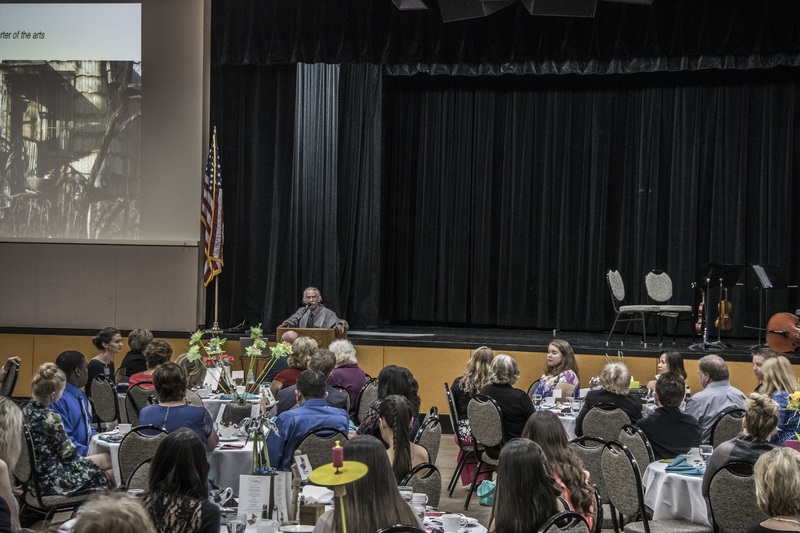 The time had come for SHSU’s thriving art community to gather for their premier annual event: the SHSU Art Gala. 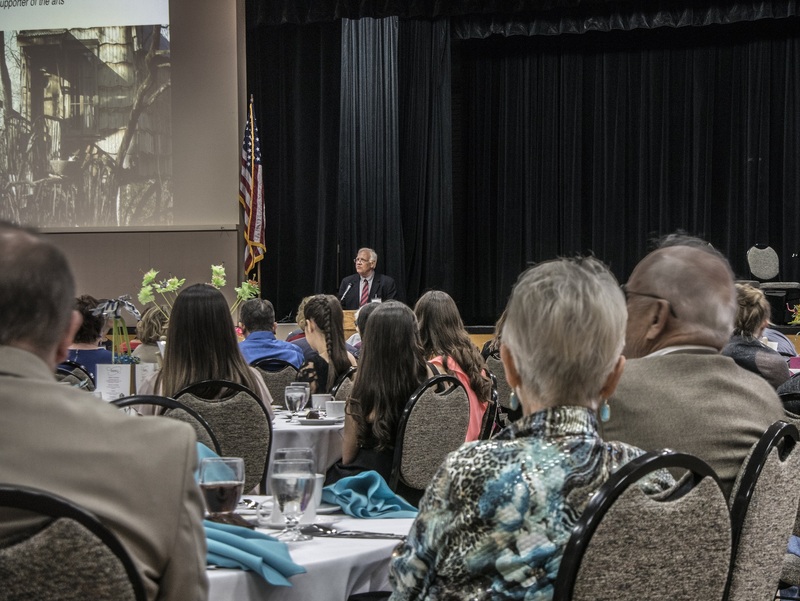 A LEAP favorite, the Art Gala not only serves as a means to meet and greet people, but it also raises money for SHSU Art Scholarships while honoring outstanding alumni and community members that contribute to the success of the Art Department. The evening began with a reception where we visited with faculty members, community members, and the evening’s award winners. We were pleasantly surprised to find many of the former heART of Huntsville participants including Ms. Una Grace Nash, Dr. and Mrs. Pease, Dr. and Mrs. Gaertner, Dr. Mitzi Mahoney, and Roberta Plant, as well as other members of the community such as former mayor Mac Woodward. 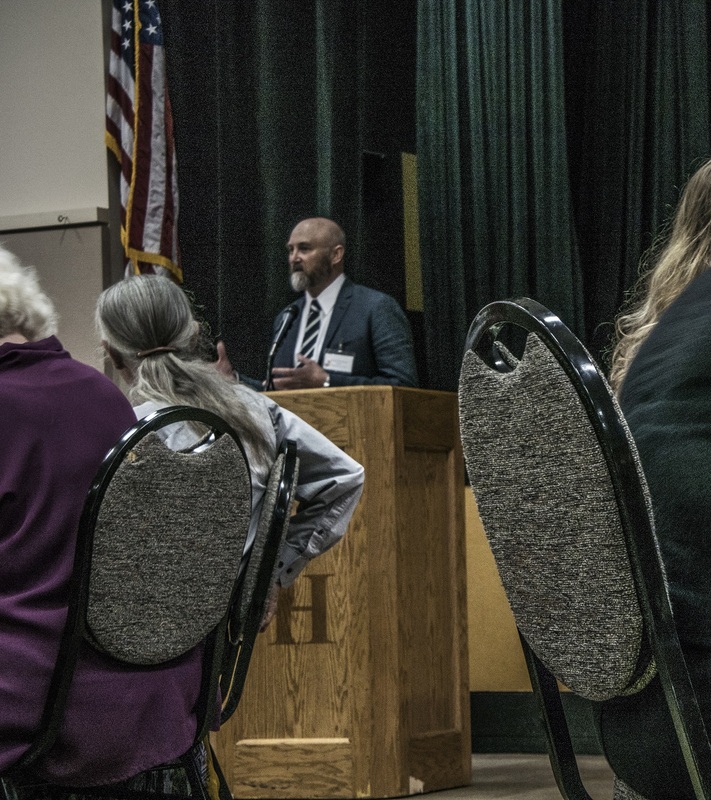 Dr. Michael Henderson, the Chair of the Art Department, greeted attendees and began the program with remarks before serving dinner. 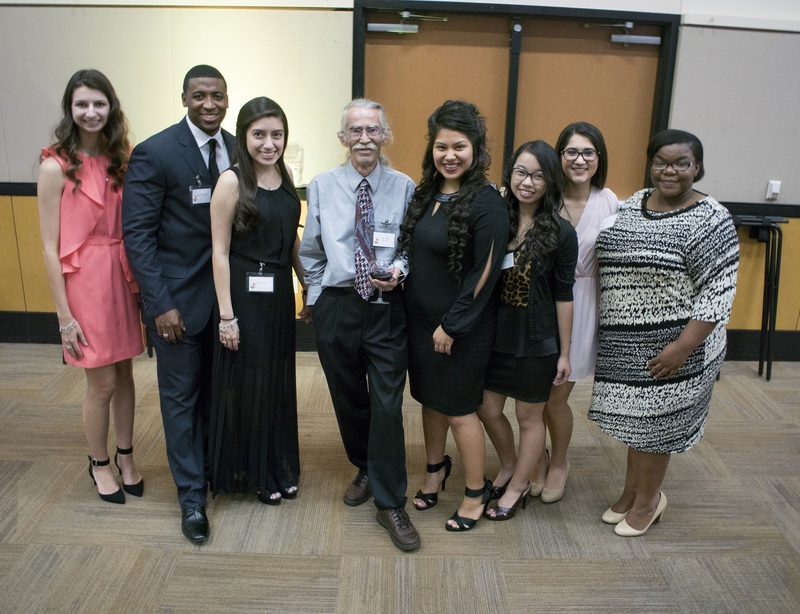 The three- course meal was marked with conversation about art, SHSU’s art program, and the impact the alumni had made. 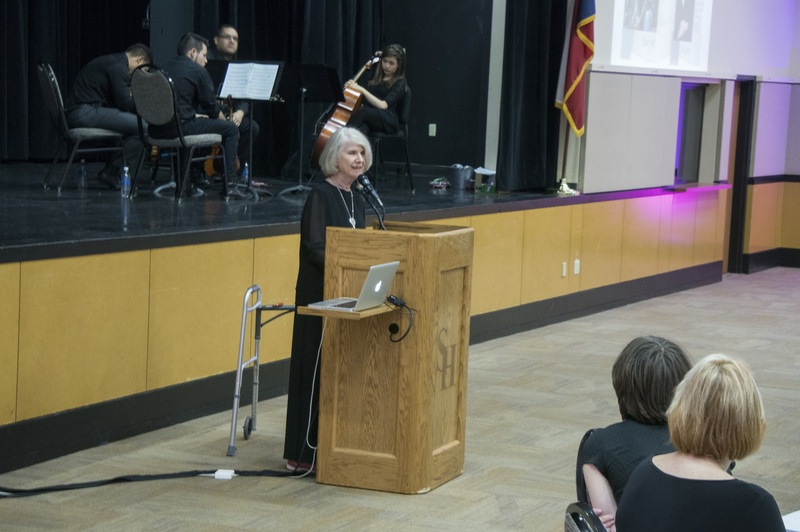 Dr. Henderson then presented two awards honoring two very special people. First, he presented Daryl Howard with the Outstanding Alumna Award. Graduating from SHSU in 1969, Daryl Howard moved to Tokyo to teach at an overseas art school where she was introduced to Ukiyo-e woodcuts from the 18th and 19th Century. These woodcuts peaked her interest and she began an apprenticeship with master printmaker, Hodaka Yoshida. However, this was only the beginning of Howard’s career as we had the privilege of learning. There were many professors that Ms. Howard learned from who were skilled artists. People such as Charles Pebworth, Gaddis Geeslin, Stanley Lea, among others. Her speech was one of gratitude for the opportunities presented to her at Sam Houston and the lessons learned from her many mentors. The second award winner, Mrs. Nancy Gaertner, was honored for Outstanding Supporter of the Arts. As former First Lady of Sam Houston, she worked tirelessly on the development and creation of our performing arts center for the College of Fine Arts and Mass Communication. Although she is no longer the First Lady of Sam Houston, she is the current President of the Friends of the Wynne Board and stays active in Huntsville’s art community. Having worked closely with her, the LEAP Ambassadors were excited to see Mrs. Gaertner honored for her commitment and support of the arts. …and said our thanks to the many wonderful people who support our Art Department. It was a fun night and a great way to support the local art community! The Art Department sponsored a nice evening for friends and supporters of the arts, honoring alumni, former faculty, and local artist/builder Dan Phillips. With all the LEAP Center Ambassadors on hand, plus some of the “friends of the LEAP Center,” it was a great way to kick off the end of the week. This was the Art Department’s second such gala and, again, chair Michael Henderson emceed the proceedings. He was gracious and thankful, and repeatedly thanked the sponsors and the many people who support the arts in the community. Community, in fact, was the explicit theme of the evening. We were happy to note that of the 29 registrants for heART of Huntsville, 19 were attendees at the Gala! …and the Department honored alums Kim Cook and Dan Pratt; Art Department Scholarship winners; local art supporter and POLS faculty Jim Carter, who passed away in 2013; and former faculty Emmette Jackson, Charles Pebworth, Gene Eastman, Jimmy Barker, and Stanley Lea. While the former faculty were not able to attend, Lea’s wife, Ruth, did attend. …which went to Dan Phillips for his support of the arts in the local community. Phillips, of course, is a local builder, whose previous careers include work in Military Intelligence, the Dance Faculty at SHSU, and newspaper writer. Phillips said very nice things about his wife, Marsha, who is a partner in the Phoenix Commotion enterprise and works as a part-time mentor at SHSU after a long career teaching at HISD. Fifteen years ago, the two embarked on a new career building homes “made from unwanted materials for low-income people.” They’ve now completed 24 projects, and their structures dot and enrich the community, adding character to a small, historic town, work that earned Phillips this well-deserved honor from the SHSU Art Department. Postscript: Following the gala, seven of the LEAP attendees headed to Dallas for their first-ever Moot Court scrimmage, which will be described in future posts!